Brevik, August 15. 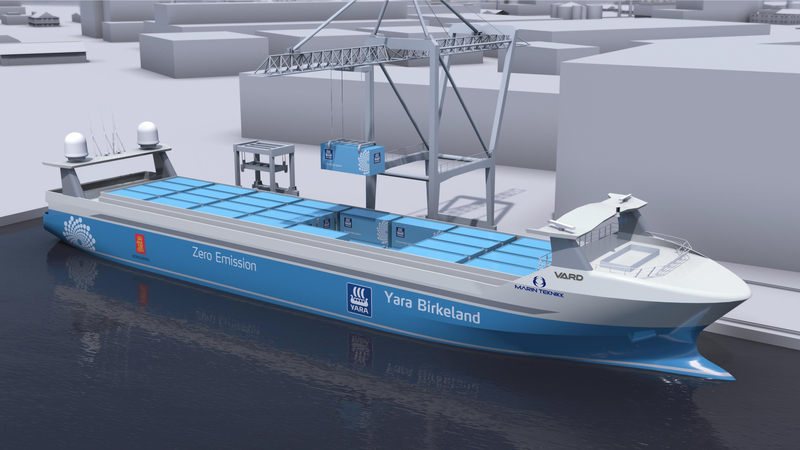 2018: The world's first autonomous and electric container vessel is one step closer to launch, as YARA signs a deal with VARD worth appr NOK 250 million to build the vessel. VARD will deliver Yara Birkeland for launch in early 2020, and the vessel will gradually move from manned operation to fully autonomous operation by 2022. 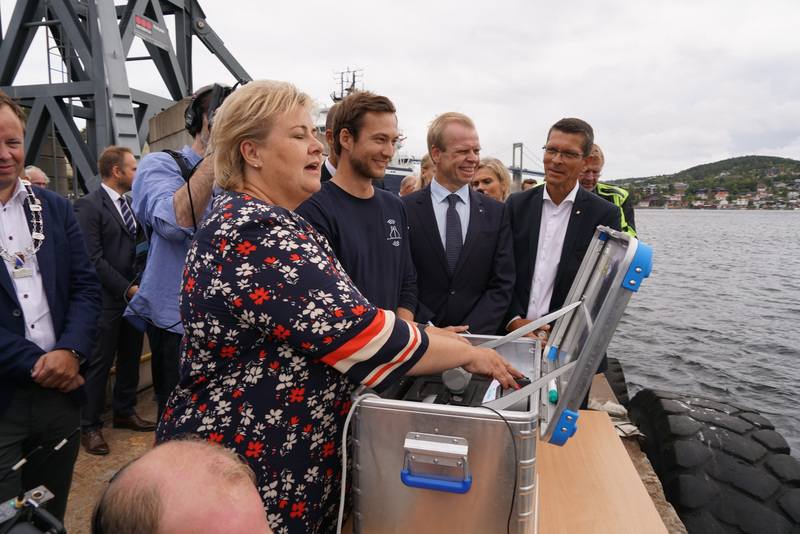 "A vessel like Yara Birkeland has never been built before, and we rely on teaming up with partners with an entrepreneurial mindset and cutting edge expertise. VARD combines experience in customized ship building with leading innovation, and will deliver a game-changing vessel which will help us lower our emissions, and contribute to feeding the world while protecting the planet," says Svein Tore Holsether, President and CEO of YARA. Mr. Roy Reite, CEO and Executive Director of VARD, commented: "We are honored to be chosen as Yara's partner in this innovative and exciting project. With a longstanding experience in building state-of-the-art and tailor-made specialized vessels, we are excited to be given the opportunity to build the world's first autonomous and electric-driven container vessel. 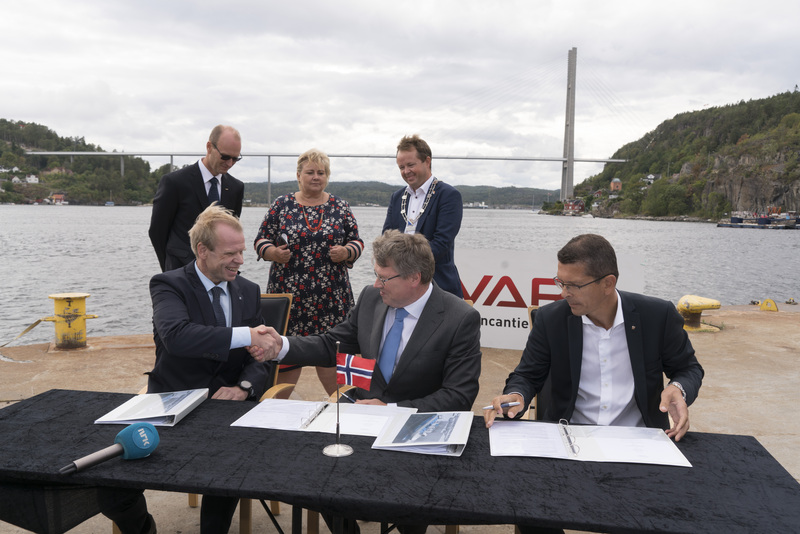 It is a pleasure to welcome Yara and Kongsberg to VARD, and we look forward to working closely with all parties involved." "This is a good example of how Norwegian industry can collaborate to create new solutions and green jobs. YARA, KONGSBERG and VARD have built on their knowledge about technology, logistics and ship building with an ambition to create sustainable innovation together. The result is exciting pioneer projects like this one. 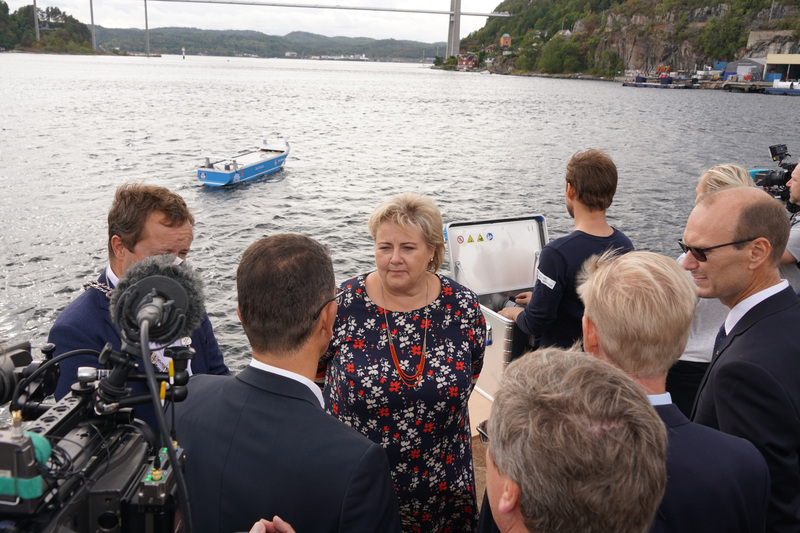 I am proud that the Government has supported the development of Yara Birkeland through ENOVA and send my best wishes for the construction," says Prime Minister Solberg. "Yara Birkeland represents an important next step for the entire maritime industry, representing a major technological and sustainable advancement. The Norwegian maritime cluster has taken a leading position within technology, design, legislation, testing and all other aspects of the development", says Geir Håøy, CEO of KONGSBERG. The project was initiated in an effort to improve the logistics at Yara's Porsgrunn fertilizer plant. Every day, more than 100 diesel truck journeys are needed to transport products from Yara's Porsgrunn plant to ports in Brevik and Larvik where the company ships products to customers around the world. With this new autonomous battery-driven container vessel YARA moves transport from road to sea and thereby reduces noise and dust emissions, improves the safety of local roads, and reduces NOx and CO2 emissions. Vard Holdings Limited ("VARD"), together with its subsidiaries (the "Group"), is one of the major global designers and shipbuilders of specialized vessels. Headquartered in Norway and with 9,000 employees, VARD operates nine strategically located shipbuilding facilities, including five in Norway, two in Romania, one in Brazil and one in Vietnam. Through its specialized subsidiaries, VARD develops power and automation systems, deck handling equipment, and vessel accommodation solutions, and provides design and engineering services to the global maritime industry. VARD's long shipbuilding traditions, cutting-edge innovation and technology coupled with its global operations and track record in constructing complex and highly customized vessels have earned it recognition from industry players and enabled it to build strong relationships with its customers. VARD was listed on the Main Board of the Singapore Exchange on 12 November 2010. The majority shareholder of VARD is Fincantieri Oil & Gas S.p.A., a wholly owned subsidiary of FINCANTIERI S.p.A. Headquartered in Trieste, Italy, FINCANTIERI is one of the world's largest shipbuilding groups and has, over its 200 years of maritime history, built more than 7,000 vessels.